KDHK, Inc. dba Allegiance Environmental Services (AES) provides eco-friendly professional cleaning services, construction clean-up, specialized floor care and an array of related services to help service your building. San Antonio-based AES is woman-owned and operated by COO Donna Flores, CESE, and CEO Kenneth Flores, CHESP, RESE, CLLM, who each have 20 years of experience and expertise in managing contract administration, operations and quality management for healthcare environmental services (HES) and commercial cleaning contracts for governmental and private sector customers. Our team is specialized in HES for military medical treatment facilities for the Department of Defense. Our executive and management team deploys all required processes, procedures, methodology, resources and corporate support to perform hospital housekeeping - inlcuding disinfection of operating rooms and surgical areas, critical care areas, laboratories, clinics, radiology, patient room terminal cleaning, and common, administrative and outoor areas cleaning; linen operations management; and waste management - including regulated medical waste and recycling. Our management team has participated in more than 40 The Joint Commission (TJC) inspections and has received consistent commendation for excellent or above average performance of aseptic hospital housekeeping that prioritizes infection control and prevention. Our customers expect performance and we control quality with rigorous cleaning standards and metrics based on Association of Perioperative Registered Nurses (AORN), Association for the Healthcare Environment (AHE), TJC, CDC and OSHA guidelines. AES uses regular surveillance to evaluate our work, and we back our inspections with a quality assessment and work order software to ensure facilities are cleaned to standard every time. AES manages commercial cleaning programs for building owners and property managers in medical office, technology centers and administrative office. AES possesses the financial strength, management expertise and depth of human resources to service one end user or multiple tenants in any size building. Facility managers demand reliability and performance, and we pride ourselves on meeting expectations with customized scopes of work and schedules, and resolving service issues quickly. Whether your facility requires cleaning services weekly, daily or day porter service, AES will individualize a service plan to meet your budget and cleaning needs. General contractors have come to rely on Allegiance for post-construction cleaning and make-ready services. Our construction division works with general contractors to assist with everything from clean-as-you-go services including debris removal and dust management to detailed final cleans to ensure walls/cielings, windows/sills, doors, floors, elevators/stairwells, bathrooms, surfaces and fixtures are washed, clean and ready for tenant move-in. AES offers an array of professional floor care services to maintain and restore all types of carpet, tile, vinyl, marble, stone, hard wood, concrete and composite flooring. We own our equipment and employ a crew of floor technicians who have been cleaning, stripping, refinishing, sealing, buffing, diamond cut polishing, re-crystalizing/filling floors for more than 20 years. Our team of experts can evaluate your flooring and develop a customized floor care program to help you revitalize and maintain your floors according to manufacturers’ recommended guidelines. AES offers ancillary services to maintain the cleanliness of your building exterior and hard surfaces. We have a strategic collaboration with a licensed (Aerial/Scissor & Boom Lift Operator) window washer who meets the requirements of OSHA regulations 29 CFR1910, the National Fire Institute, and the American National Standards Institute, and has the demonstrated capability to perform any level of cleaning of acrylic or glass surfaces at various levels of a structure. AES employs a local, broadly trained and background-screened workforce, meeting customer's health requirments, to provide our customers with peace of mind that your building is in qualified and reliable hands. Additionally, our operations manager has completed OSHA 30-Hour General Industry safety training. AES holds the International Sanitary Supply Association Cleaning Industry Management Standard - Green Building with Honors (ISSA CIMS-GB) certification - the first consensus-based management standard that outlines the primary characteristics of a successful, quality cleaning organization, and certification criteria based on the U.S. Green Building Council’s (USGBC) LEED guidelines. ISSA is the worldwide cleaning industry association representing an international group of companies from the cleaning, maintenance and janitorial industries. 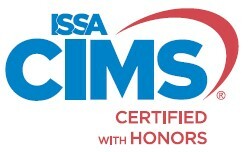 CIMS certification is the preeminent voluntary consensus standard (VCS) for the cleaning industry and is recognized by Federal governmental contracting offices as a primary pre-qualification requirement. A rigorous site inspection and evaluation is required before certification is awarded, and a favorable site inspection must be conducted to achieve renewal every two years. The USGBC includes CIMS-GB as a direct compliance option for the new "Green Cleaning Policy" prerequisite, and facilities may simply utilize a CIMS-GB certified cleaning service provider. AES’s green cleaning processes, procedures and chemicals/supplies/equipment demonstrates our capability to assist customers in achieving LEED EB: O&M points and offers them assurance that when they engage AES, we are prepared to partner with them in achieving their LEED goals. We are proud and active members of AHE, Association for Professionals in Infection Control and Epidemiology (APIC), International Association of Executive Housekeepers (IEHA), ISSA, Power Washers of North America (PWNA) and the North San Antonio, South San Antonio and San Antonio Hispanic Chambers of Commerce.